I've finished another block of my Travel Afghan, #41. Whenever I go on a trip I buy a ball of yarn that, for some reason, reminds me of the area or the purpose of the trip. 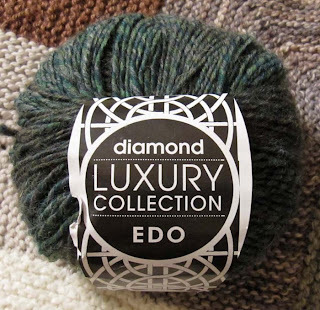 This time I chose Diamond Luxury Collection Edo that I bought at Wool-Tyme in Kingston, Ontario when I was visiting over Christmas. The yarn is a DK weight, 25% alpaca, 25% virgin wool and 50% microfibre - color 02 Miso. I had two reasons for picking this yarn: it was Christmastime and I associate the color green with Christmas and I'd never seen this yarn anywhere before. It didn't hurt that it was in the bargain bin, the last of the dye lot. It a pretty yarn, tweed-y, with a combination of a very slightly variegated green with black running throughout the ball. To make this afghan I'm following a favorite pattern: Rambling Rows. It's made up of 3 mitered shapes: large squares, small squares and the rectangle that you see below. There are a total of 55 blocks, plus the border, in the pattern, so I won't be finished anytime soon. That's okay. I'm in no hurry. I have no idea what the finished afghan is going to look like, but it's going to unique and full of memories! I won't call this an F.O. (finished object) until the entire afghan is completed. Next up is my trip to Macon in May. Harry Manx - The First "Music Monday"